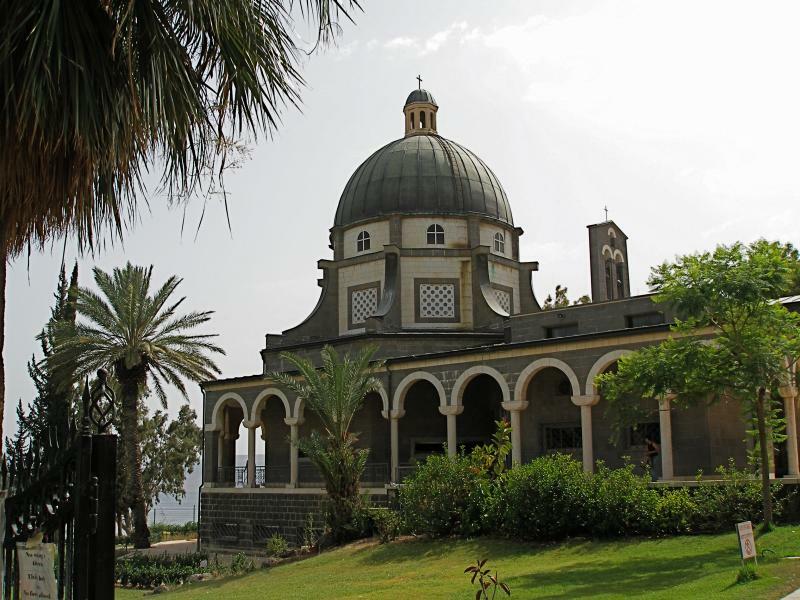 The red-domed Greek Orthodox church on the edge of the Sea of Galilee at Capernaum has become an icon of the Holy Land, though it is more often photographed than visited. 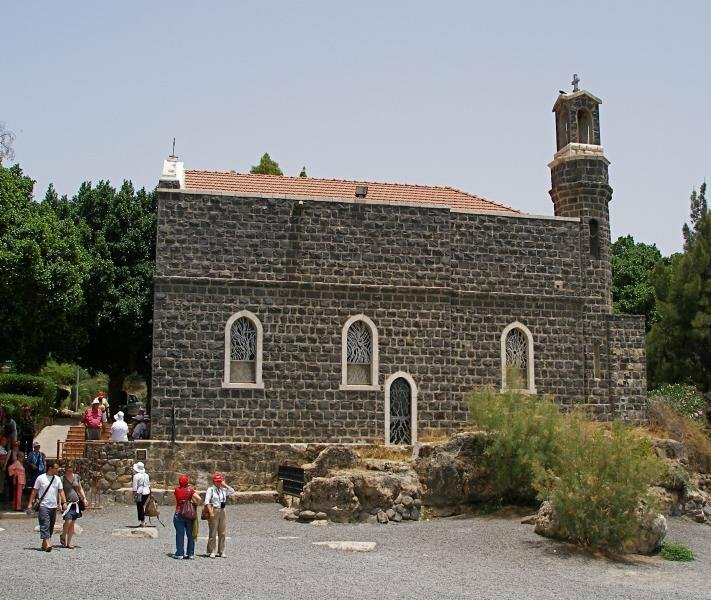 The Church of the Twelve Apostles takes its name from the Gospel account of Jesus choosing the Twelve, an event that took place on a mountain in this area of Galilee. 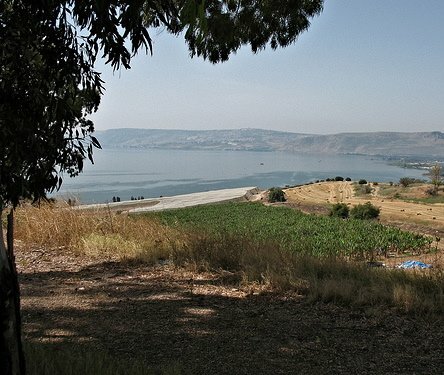 But it is also known as the Church of the Seven Apostles — a reference to Jesus’ post-Resurrection appearance by the Sea of Galilee to seven of his disciples — Simon Peter, Thomas, Nathanael, James and John “and two other disciples” (John 21). 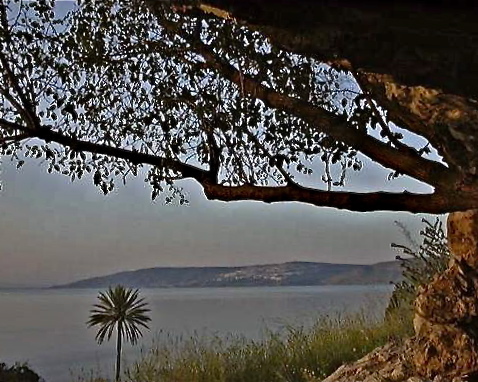 Jesus had made Capernaum his home town. 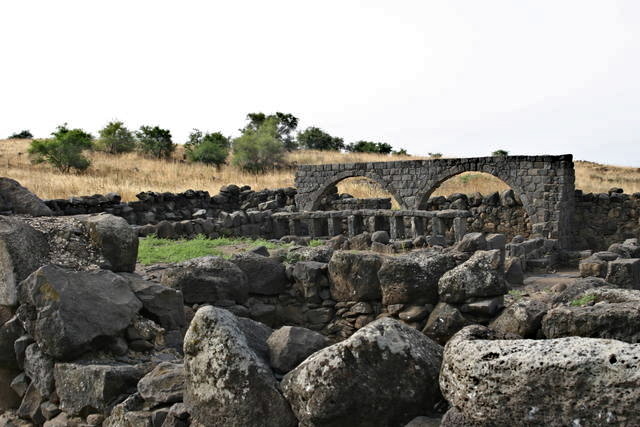 The Church of the Twelve Apostles occupies a site to the east of ancient Capernaum, where survivors of a devastating earthquake in 749 relocated their village. A small, cross-shaped building with white walls, the Church of the Twelve Apostles has two central domes surrounded by six smaller ones, each topped by a cross. Built in 1931, it stands close to the shore, in a secluded haven of lush trees and gardens. Inside, the walls and ceilings are covered with impressive frescoes depicting biblical themes. The Church of the Twelve Apostles is believed to stand on the site of a Byzantine church dedicated to St John the Theologian. 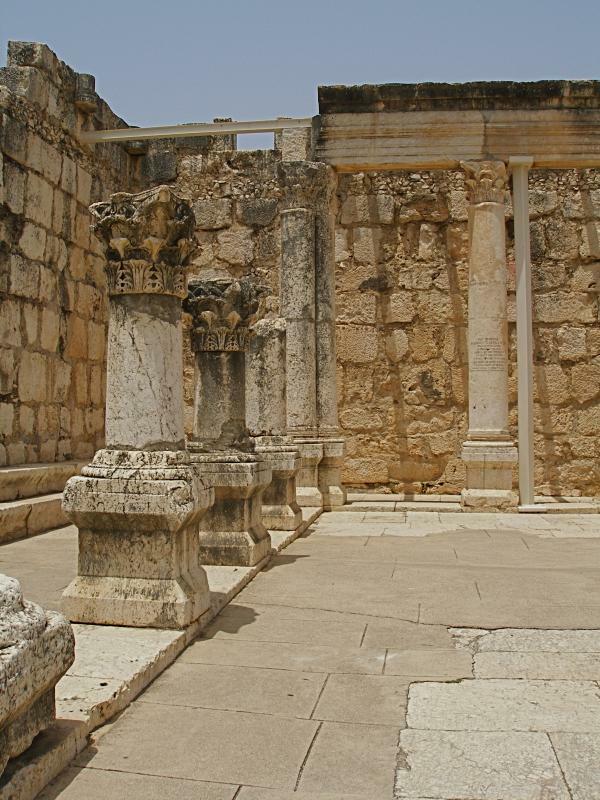 Capernaum had been in ruins for several centuries when the site was purchased by the Greek Orthodox Patriarchate of Jerusalem and the present church erected. But following the 1948 Arab-Israeli War, the church found itself in a demilitarised zone between Israel and Syria. Local Christians or pilgrims had no access to this no-man’s land, so the church and its adjacent monastery fell into decay, and Druze residents used the church as a barn. 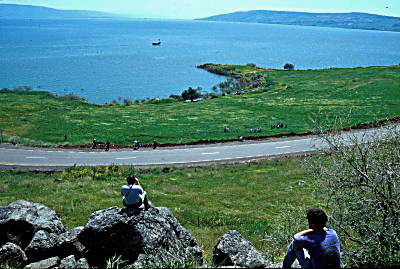 After the Six Day War in 1969, when Israel pushed its border back to the Golan Heights, restoration of the church began with the removal of a thick layer of cow manure covering the floor. Between 1995 and 2000 the church was redecorated by a Greek iconographer with an eclectic array of Byzantine-style frescoes inspired by works in Orthodox churches and monasteries in various parts of the world, in particular the Balkans. Brightly-coloured frescoes and icons cover most of the ceilings and walls of the church. Inside one dome, Christ the Pantocrator (All-powerful) is surrounded by a chorus of 12 prophets who foretold his coming. In the other dome, Christ is shown as an old man under the title of the Ancient of Days — a name for God from the Book of Daniel — and surrounded by 12 patriarchs. Other frescoes and icons depict the Crucifixion, the Resurrection, the Madonna and Child, saints who lived in the Holy Land and Galilean scenes from the Gospels — Jesus walking on the water, the calming of the storm, the miraculous catch of fish and the healing of the paralysed man. The most striking fresco, a dramatic portrayal of Judgement Day, covers the back wall of the church as a reminder to departing faithful that they will be judged by what they do during their earthly lives. It vividly conveys the contrast and tension between the glory of those who are saved (on the left of the fresco) and the horror of those who are damned (to the right). The two groups are separated by a river of fire leading down to hell. 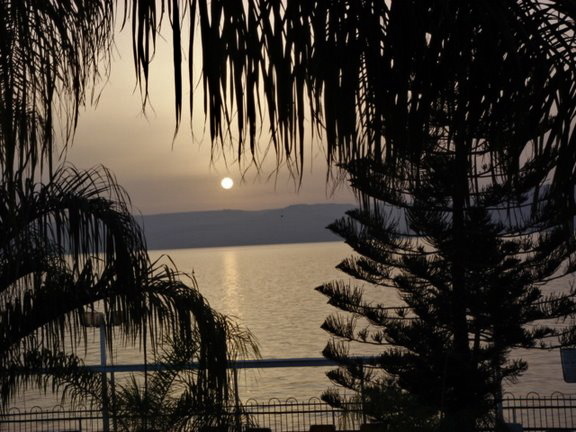 Magdala was a major first-century port on the Sea of Galilee, a centre of trade and commerce, and an exporter of salted fish to markets as far away as Europe. Archaeological discoveries early in the 21st century have made it a burgeoning pilgrimage destination. 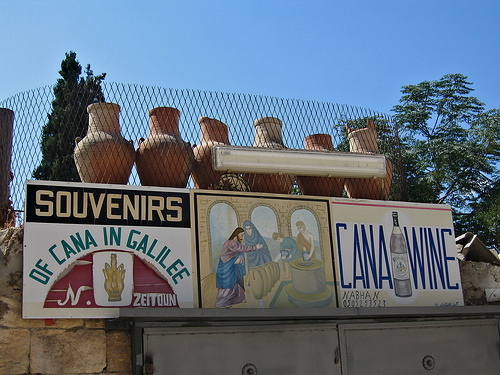 Magdala’s fame down the centuries rested on one notable person, Mary Magdalene. This enigmatic woman — revered as a saint by the Orthodox, Catholic, Anglican and Lutheran churches — was one of the few persons named in the Gospels as being present at Christ’s crucifixion and the first recorded witness of his Resurrection. Whether she lived in Magdala or was simply born there is unknown, but she was apparently a wealthy woman. 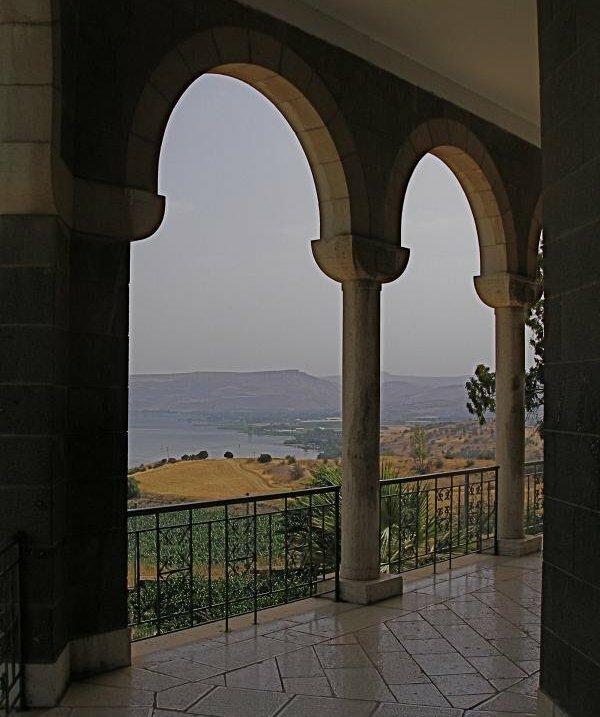 The city, on the western side of the Sea of Galilee between Tiberias and Capernaum, is mentioned only once in the New Testament. 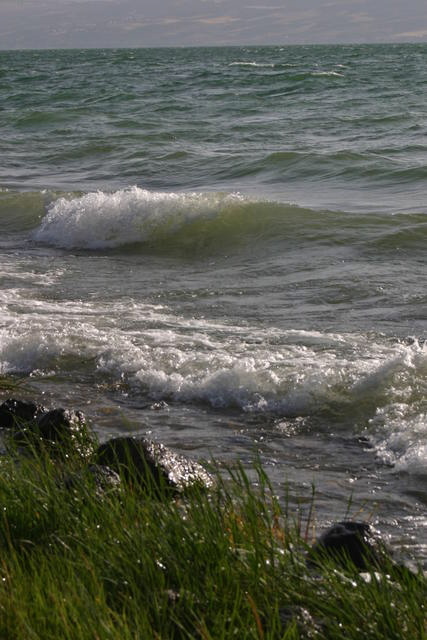 The Gospel of Matthew (15:39) says Jesus went there by boat — but even this reference is uncertain, since some early manuscripts give the name as Magadan. 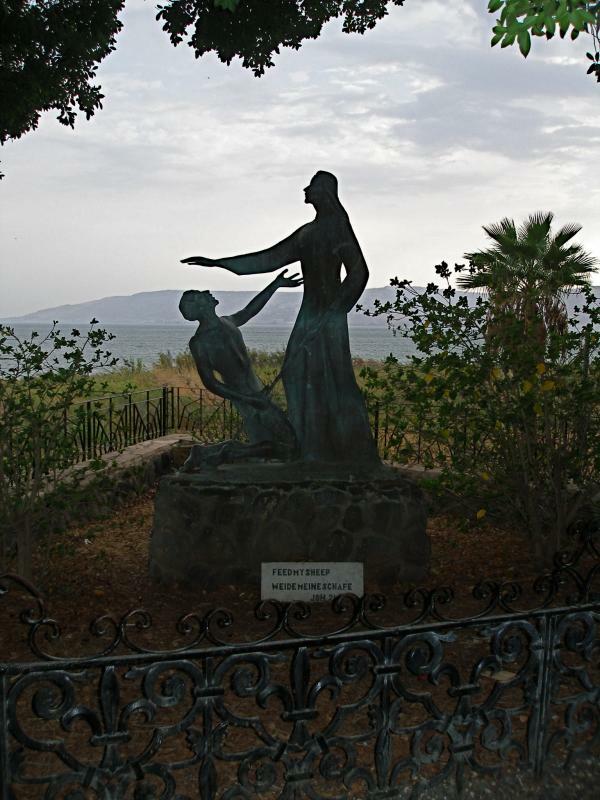 Both Matthew and Mark say Jesus preached in synagogues “throughout Galilee”, and Magdala was only 10 kilometres from Capernaum, where he based his ministry. 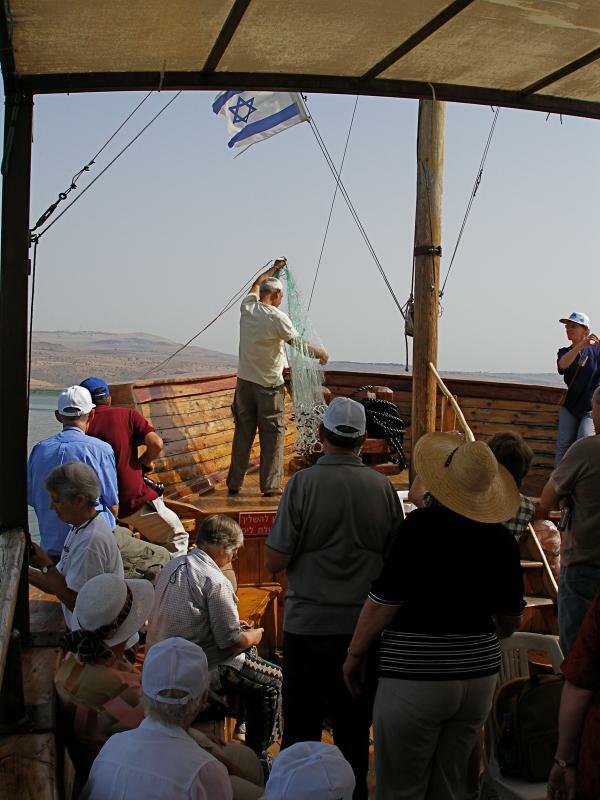 The Jewish historian Josephus says Magdala had a population of 40,000 people and a fleet of 230 boats about 30 years after Jesus died. All four Gospels refer to a close follower of Jesus called Mary Magdalene. Luke says she had been cured of “seven demons” and he lists her first among the women who accompanied Jesus and supported his ministry from their own resources (8:2-3). By the 3rd century, Mary Magdalene was described by the theologian Hippolytus of Rome as the “apostle of the apostles”. But Mary’s identity became confused in 591. In that year Pope Gregory the Great gave a sermon which expressed his belief that the Mary who had been cured of seven demons was the same person as the penitent prostitute who anointed Jesus’ feet with ointment (Luke 7:37-50) and Mary of Bethany, the sister of Martha and Lazarus, who anointed Jesus’ feet with perfume (John 12:3-8). A revision of the Catholic calendar of saints in 1969 reverted to the Eastern tradition of distinguishing Mary Magdalene from the reformed prostitute. By then, however, this persona had endeared her to artists down the centuries. More recently, Dan Brown’s The Da Vinci Code mined a rich lode of pseudo-Christian texts to present Mary Magdalene as the wife of Jesus and co-founder of an arcane dynasty at odds with the institutional Church and its beliefs. And what really became of Mary? A Greek tradition has her dying in Ephesus, with her relics preserved in Constantinople. A French tradition says she converted Provence to Christianity and her relics ended up in Vézelay Abbey in Burgundy, where they are still venerated. 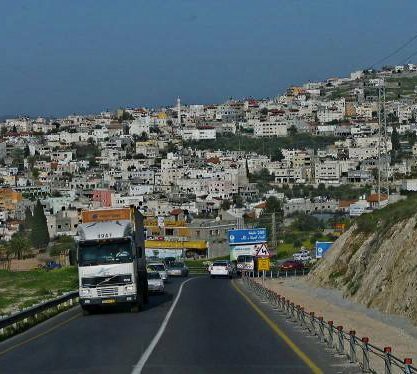 The city that gave its name to Mary Magdalene became a fortified base for rebels during the First Jewish Revolt in AD 66-70, even engaging the Romans in a disastrous sea battle. 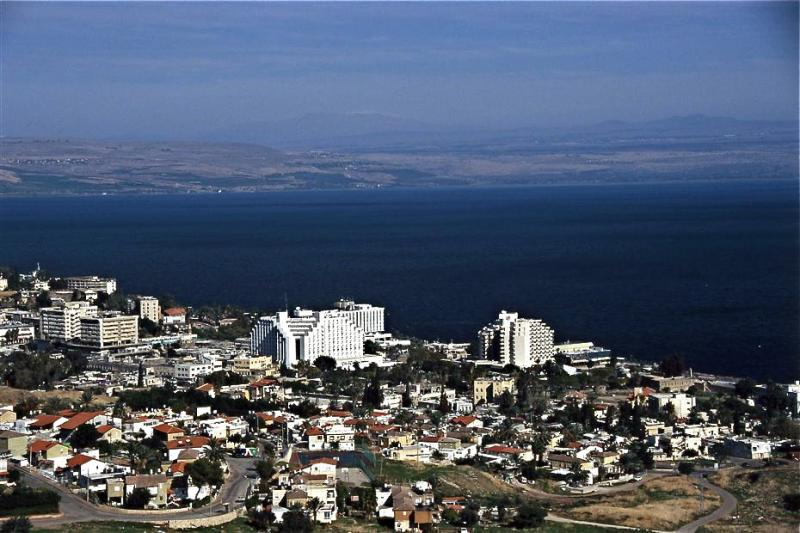 According to the historian Josephus — who commanded the Jewish forces in Galilee — the Sea of Galilee became red with blood and “full of dead bodies”. Of the survivors, emperor Vespasian sent 6000 to build a canal in Greece and ordered more than 30,000 to be sold as slaves. 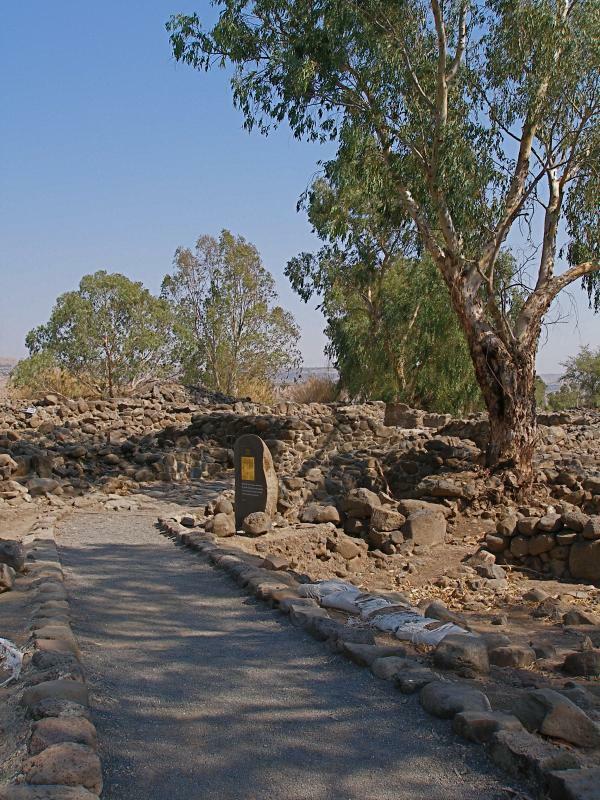 Magdala continued as a much-reduced Jewish village during Roman and Byzantine times, and in more recent centuries as an Arab village until 1948. Mark Twain visited it in 1867, calling it “thoroughly ugly, and cramped, squalid, uncomfortable, and filthy”. 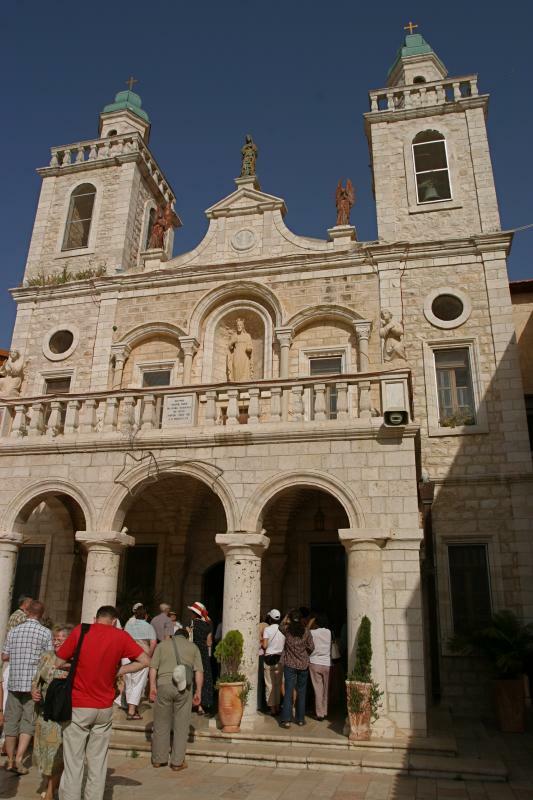 In the 4th century a church was built on the reputed site of Mary Magdalene’s house. Destroyed in the 7th century, it was rebuilt by Crusaders in the 12th century but was converted into a stable when the Crusaders were expelled from the Holy Land. 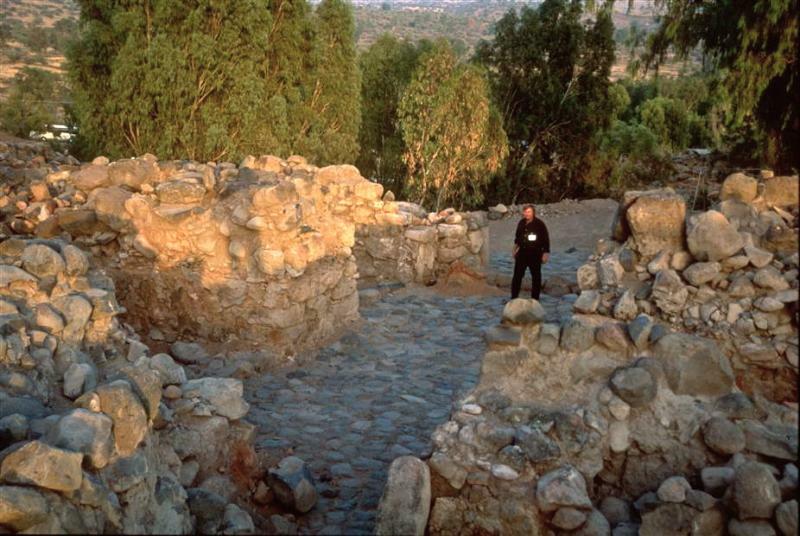 Beginning in the 1960s, Franciscan archaeologists discovered Magdala’s ancient port and a city grid, with paved streets, water canals, a marketplace, villas and mosaics — one depicting a sailing boat. Buried in the mud covering a thermal bath complex were ceramic crockery, perfume jars, jewellery, hairbrushes and combs, and bronze applicators for make-up. The discovery of the massive foundations of a tower may account for the city’s name. 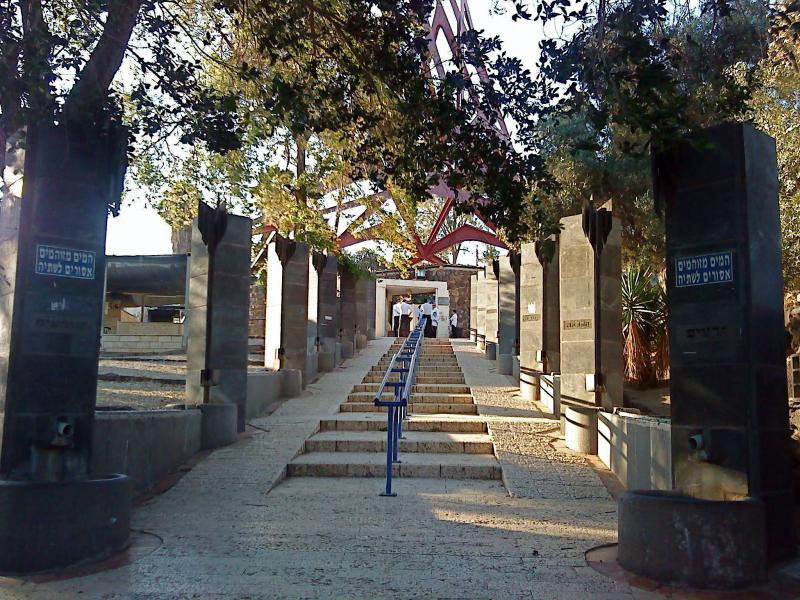 Both Magdala in Aramaic and Migdal in Hebrew mean “tower”. 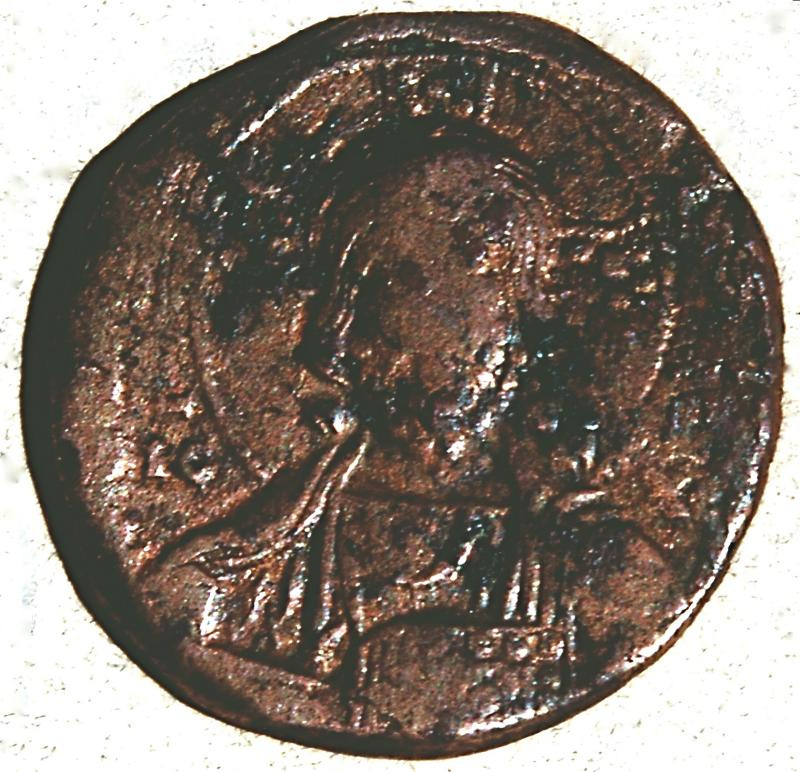 More archaeological remains were uncovered in 2009 on an adjacent property newly acquired by the Legion of Christ to establish a hotel, institute for women and retreat centre. The Legion, a Catholic congregation, manages the Notre Dame Center in Jerusalem. 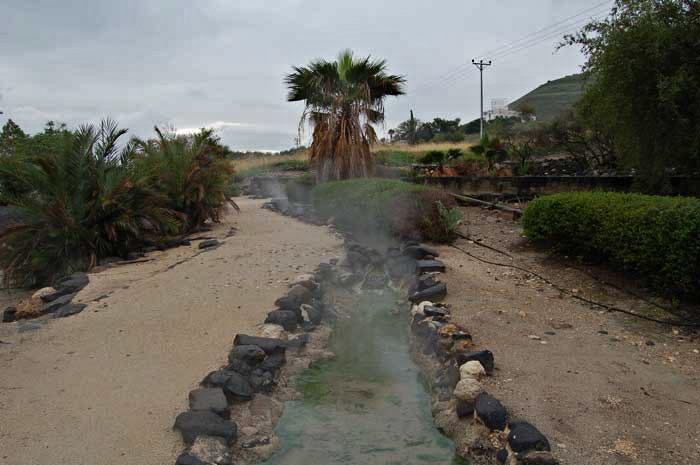 Three interconnected ritual baths were discovered, the first found in Israel using groundwater from springs — which for purification purposes was considered “living water” — rather than rainwater. 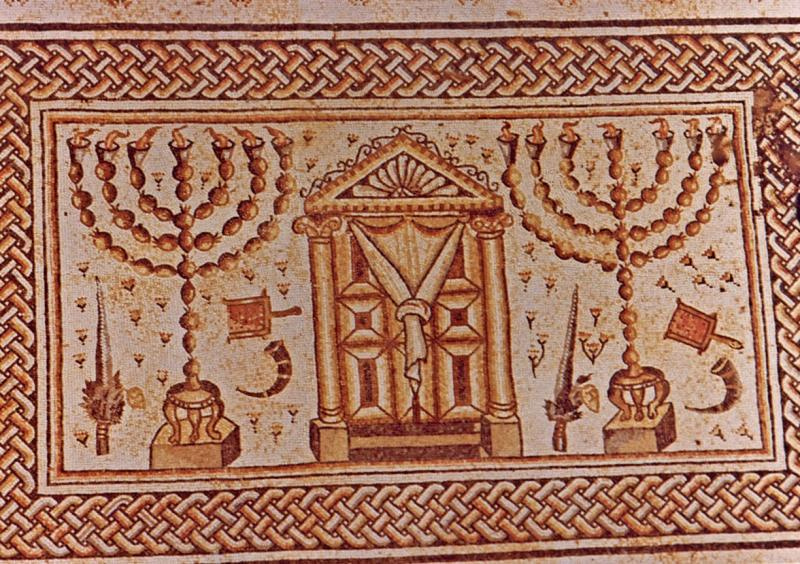 In the remains of one building, under a thin layer of soil, excavators found a stone block engraved with motifs including a seven-branched menorah, the type of lampstand used in the Temple. 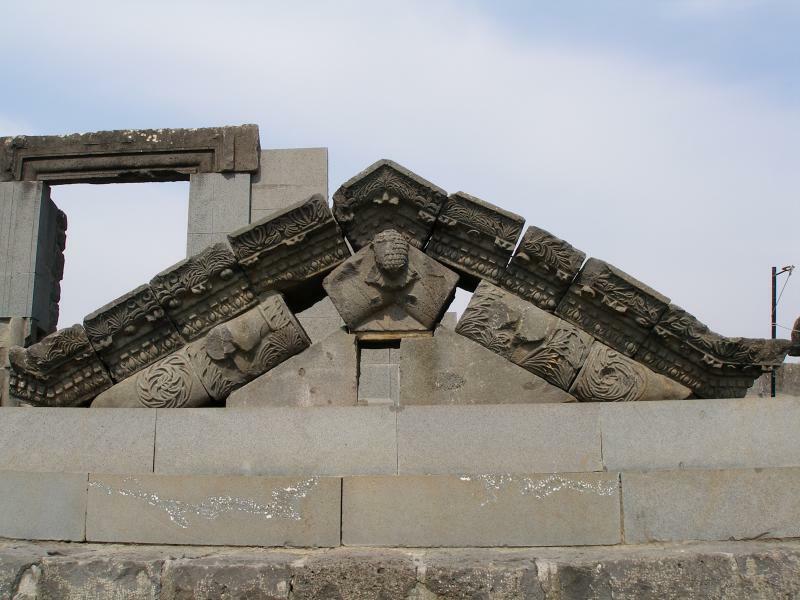 This significant find led to the identification of the building as a synagogue. 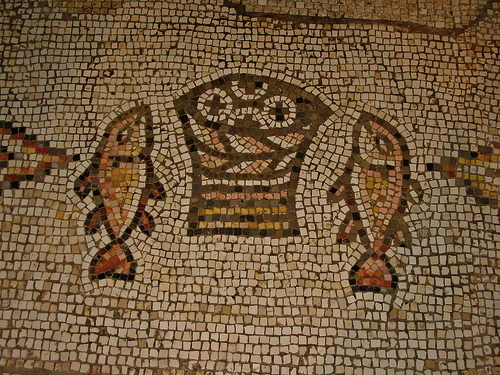 Unlike other first-century synagogues found in Galilee, the Magdala building had ornate mosaics and frescoes. In 2014 the Legion opened a new church on the site, simple in design but also rich in mosaics and murals, focusing especially on women in the Bible. 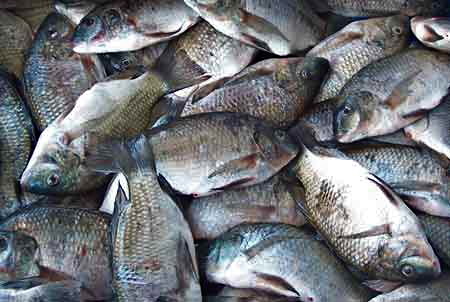 It is named Duc in Altum (Latin for “Put out into the deep”, from Christ’s words in Luke 5:4). The altar is in the shape of a first-century boat, standing in front of an infinity pool leading the eye to the lake beyond. In the crypt is an ecumenical worship space, called the Encounter Chapel, paved with stones from Magdala’s first-century marketplace. 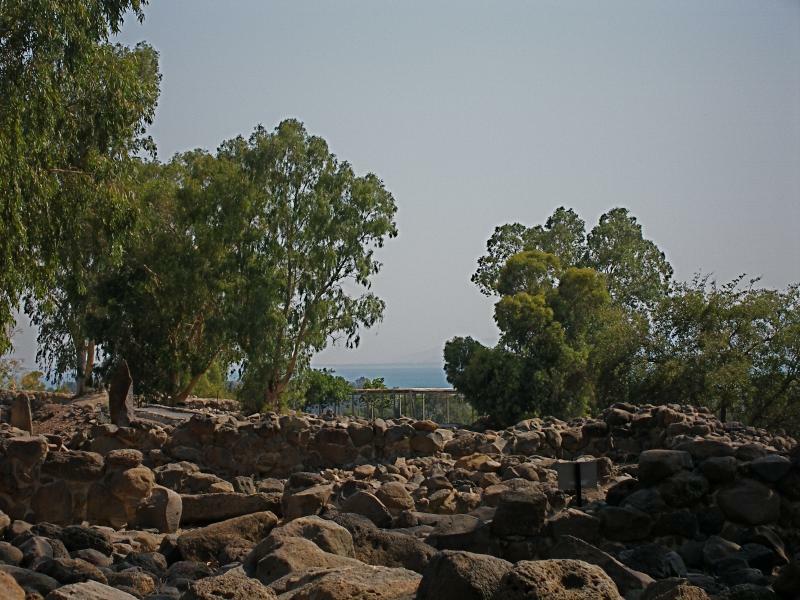 Magdala’s port, now submerged in the beach, had a stone breakwater that extended into the sea and curved around the harbour to protect boats from the sudden storms that buffet the Sea of Galilee. 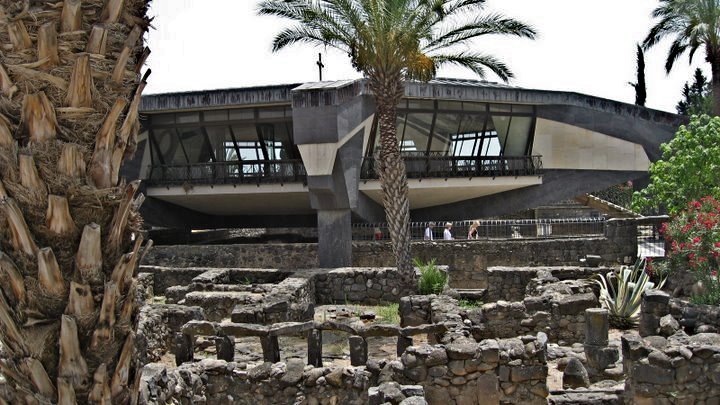 In 1986 the hull of the so-called Jesus Boat, a fishing boat old enough to have been in use during the time of Christ, was found in the lakebed near the ancient port of Magdala. Bagatti, Bellarmino: Ancient Christian Villages of Galilee (Studium Biblicum Franciscanum, 1999).